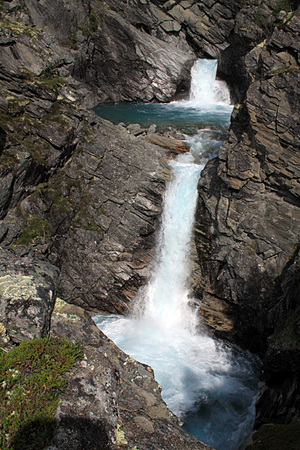 Billingenfossen or Billingfoss is an official named waterfall at Billingen, along road 15 between Lom and Oppstryn. The nice Billingenfossen cascades down over several steps and is nice to see. After heavy rainfall even impressive to see. From Billingen it is possible to follow a trial along the river into the Skarvdalen. There is a big rock lying over the waterfall, a nice way to cross the waterfall.